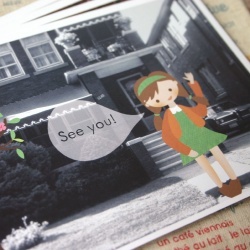 Home :: GREETING CARDS :: Shutterbug Series :: See You! Our new shutterbug series is a creative combination of photography + digital illustration. The house in the background of this note card is actually my husband's childhood home. Browsing through his old photos one day, I thought it would be amazing to add an illustration to the forefront! White borders give this an old school shutterbug feeling!